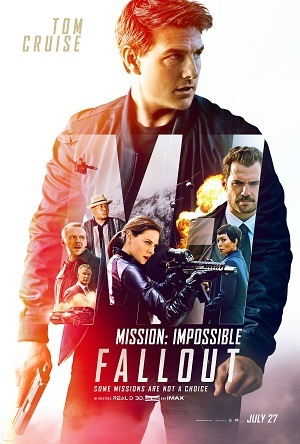 Like any of the five previous installments in Tom Cruise’s astonishingly popular Mission: Impossible franchise, knowing as little as possible about Mission: Impossible – Fallout before stepping into the theatre the more likely the viewer is going to have one heck of a terrific night out at the movies. 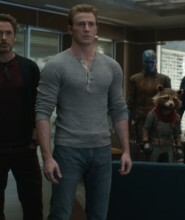 Not because the plot is overly intricate and filled with unexpected twists and turns, (in all honesty figuring out where this latest installment is headed is fairly easy), but more because you’ll have less of an idea the crackerjack practical stunts the filmmakers have devised for their international superstar actor to try and survive this time around. In this entry of the series it’s more motorcycle action, a halo jump, bathroom fisticuffs and a crackerjack helicopter chase where Cruise actually pilots the darned thing himself (but not before hanging off the side of it for a good two or three minutes before taking the controls). It’s all as crazy as it sounds. Better, it’s even more entertaining. As good as this series has been and as much as 2011’a Mission: Impossible – Ghost Protocol has towered above them all for some time now, this sixth entry is the new high water mark for the franchise. Returning Mission: Impossible – Rogue Nation writer/director Christopher McQuarrie has raised the stakes to such an extent I’m almost flabbergasted by what it is he has achieved. The first direct sequel, it’s almost as if he used that 2015 hit as a dry run for all he was going to attempt this time around. There is a fluidity and a cohesiveness to the storytelling that’s spectacular. Couple that with the type of action the likes of which Howard Hawks, John Frankenheimer and William Friedkin would stand up and cheer and we have all the makings of a sensation that ranks right up there with some of the finest the genre has produced during the 21st century. With the capture of Solomon Lane (Sean Harris), the Syndicate is in shambles. But a number of their operatives are still at-large, and considering how dangerous they are it’s no wonder putting them behind bars and spoiling their various terrorist plots has become the Impossible Mission Force’s (IMF) number one priority. 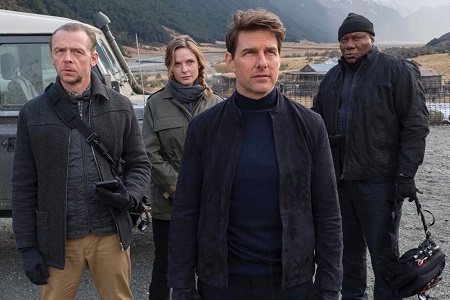 After an attempt to stop the group, now calling themselves The Apostles, from obtaining three plutonium cores goes off the rails, under order from the President Ethan Hunt (Cruise) and his team now find their every move shadowed by the C.I.A. Remorseless killer August Walker (Henry Cavill) isn’t just an observer, he’s also around to make sure no one deviates from their mission to locate the plutonium before the Apostles can manufacture and detonate a trio of nuclear bombs. If they do, he’s got orders from his boss Erica Sloan (Angela Bassett) to use whatever force he deems necessary, including lethal, to get them back on track. There are complications, not the least of which is the fact Hunt and Walker unsurprisingly don’t trust one another. But former MI6 agent Isla Faust (Rebecca Ferguson) is also hanging around for some reason, while a secretive arms dealer known as The White Widow (Vanessa Kirby) with link’s to Hunt’s past holds vital information that will hopefully lead the IMF agents to the plutonium. Additionally, there’s a mystery man calling himself “John Lark” who appears to be orchestrating events in ways that defy rational belief, The Apostles apparently looking to him as their new leader with Lane incarcerated. 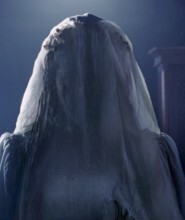 As much as Hunt is loath to admit it, the key to solving this mystery might just be contained in the head of the one man who came the closest to ruining his life and murdering all he held dear not so long ago: the aforementioned Solomon Lane, the former head of the Syndicate. Pulling from a variety of sources for inspiration (most notably John le Carré’s spy novels, James Bond, John Boorman’s Point Blank and Jackie Chan’s Police Story series), McQuarrie magically balances a myriad of varying characters and subplots without losing sight of the bigger picture. Interspersed between bouts of cleverly crafted pieces of exposition the director stages astonishing sequences of mayhem that get bigger, bolder and more impressive as events catapult their way to a conclusion. 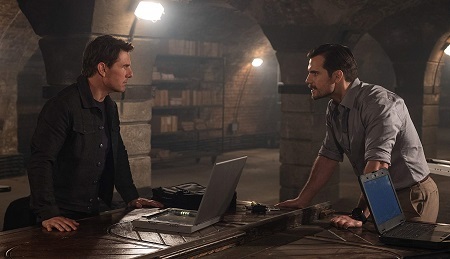 T the director also plants a number of witty callbacks to all five of the previous Mission: Impossible installments and does so in a way that feels authentically organic to this story and not placed there just as some hackneyed piece of misbegotten fan service. Instead, these moments all help push the plot forward, and whether it be remembering the circumstances in which “Job” met “Max” or recollecting that Hunt enjoys taking vacations free-climbing walls of jagged rock, McQuarrie freely pulls from his hero’s past in order to make his and his team’s future prospects feel even more in jeopardy. But it is the orgiastic nature of the action sequences that are undeniably the true draw here. The bare-knuckles bathroom showdown which shows Hunt and Walker barely able to fend off an unknown mystery assailant. A spellbinding sprint over the rooftops of London featuring a breakneck leap that resulted in Cruise breaking an ankle (which also happens to be the take used in the movie). 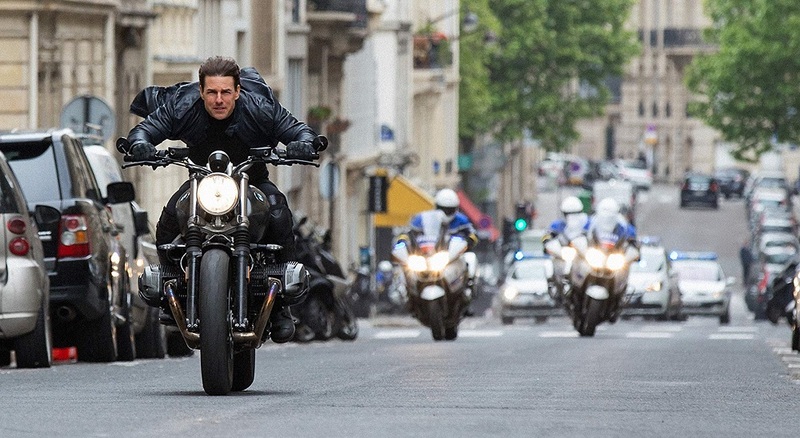 A motorcycle chase through the streets of Paris that’s a full-throttle, viscerally intense spine-tingler that puts near-perfect similar sequences in both Mission: Impossible II and Mission: Impossible – Rogue Nation to absolute shame. A mountaintop face-off between predator and prey that culminates with some of the more jaw-dropping cliff dangling this side of 1993’s Cliffhanger. A high-altitude aerial duel between a pair of helicopters with, as already mentioned, Cruise piloting one of the whirlybirds himself. McQuarrie stages it all magnificently. With gigantic assists from cinematographer Rob Hardy (Annihilation), editor Eddie Hamilton (Kingsman: The Golden Circle) and composer Lorne Balfe (The Florida Project), the director achieves a primeval elegance that’s heart-stopping. As much as I enjoyed many of his previous endeavors behind the camera, most notably his first Cruise collaboration Jack Reacher, never has McQuarrie showcased the level of craftsmanship, care and attention to every minute detail as he does here. I loved the way that the script ties up some of the loose ends left dangling from previous installments, most notably ones concerning Hunt’s feelings for his in-hiding ex-wife Julia (Michelle Monaghan) and how she in turn continues to feel for him. I also adored how the director gave Luther Stickell (Ving Rhames) and Benji Dunn (Simon Pegg) new things to do while at the same time exploring just how important their friendship with their IMF team leader has somehow managed to become over the past two decades. Most of all, he allows the viewer insight into the toll these 22 years of government service have exacted upon our hero, and even if Hunt doesn’t look like he has any intent to slow down anytime soon, it’s equally clear that no matter how good the mask the battle scars of his various ordeals can no longer be hidden quite like they used to be. It’s easy to think, especially after Mission: Impossible – Ghost Protocol and its exhilarating Burj Khalifa climbing sequence and Mission: Impossible – Rogue Nation and its dangling from the exterior door of an Airbus A400M Atlas during takeoff pre-credits prologue, that the only reason this series continues to fascinate audiences around the globe is the sight of a now 56-year-old Cruise laying his life on the line to do almost all of these stunts himself. As astonishing as that might be, and it’s admittedly something else and I don’t think we’ve seen its like since Jackie Chan during his Police Story III: Supercop heyday, I think the reason that these films continue to resonate has more to do with the fact they put character and story first before the action, that component the key ingredient that I believe keeps bringing people back to see more. While some installments are certainly more successful than others, at its absolute worst every entry in this series has still been a good one worthy of multiple watches. The same cannot be said about James Bond. It cannot be said about Jack Ryan. It cannot be said about Jason Bourne. Heck, it can’t even be said about other long-running, big budget Hollywood sci-fi fare like Star Trek, the Marvel Cinematic Universe or even Star Wars. So when I say Mission: Impossible – Fallout isn’t just the best film of the series but one of the great action epics of our time know that I mean it, McQuarrie lighting the fuse on a piece of high-octane summertime entertainment we’re going to be excitedly talking about for a quite awhile to come.